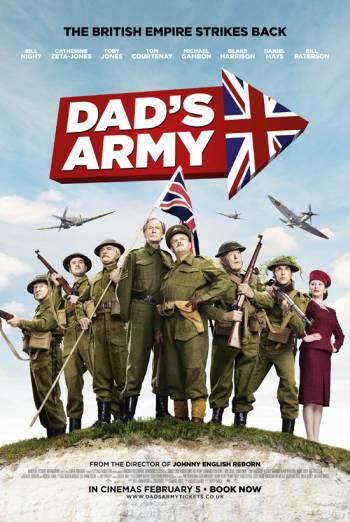 Summary DAD'S ARMY is a British war comedy about a Home Guard platoon who must help MI5 uncover a German spy. DAD'S ARMY is a British comedy about a Home Guard platoon who must help MI5 uncover a German spy. There are uses of mild bad language such as 'bloody', 'arse', 'sod' and 'balls', as well as very mild terms including 'God' and 'Christ'. There is battle scene in which two opposing sides exchange gunfire, but there is no sight of injury or any significant impact detail. A character is punched in the face and then kicked in the stomach, but this is without impact or injury detail. There are some mild moments of comic innuendo, which include lines of dialogue such as "you slipped her your sausage" and "I'm on top tonight".